After launching the second-iteration of its Moto Z Force smartphone, it seems the Lenovo-owned company is preparing to add another device to its portfolio. Motorola is long-rumored to be working on the Moto X4. The smartphone was expected to be launched on July 25 which clearly did not happen. However, latest information throws light on the pricing details of the upcoming smartphone, suggesting an imminent launch. According to tipster Roland Quandt, the Moto X4 will carry a price tag of EUR 350, which translates to approximately Rs 26,400, N130530. As mentioned in his tweet, this price is meant for Eastern Europe and for the 32GB storage variant. “Moto X4 32GB will have some interesting pricing it seems. ~350 Euro in eastern EU. Lower than I thought,” his tweet read. The Moto X4 has shown up online time and again. Recently, the smartphone was spotted on Geekbench revealing some key specifications. The Moto X4 is expected to feature either a 5-inch or 5.2-inch full HD display. 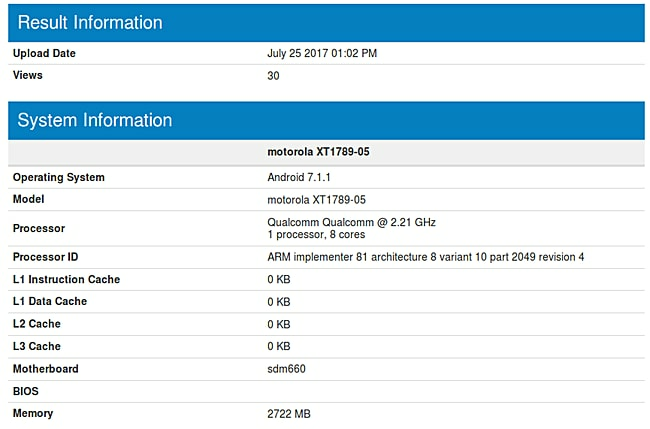 According to the Geekbench listing, the Moto X4 runs on the latest Android 7.1.1 Nougat. Under the hood, it is equipped with Qualcomm’s recently launched Snapdragon 660 octa-core processor clocked at 2.21GHz and paired with 3GB of RAM. Some reports hint at another variant of the Moto X4 with 4GB of RAM and 32GB of onboard storage. Meanwhile, a separate listing on GFXBench shows that the smartphone will instead house Qualcomm’s Snapdragon 630 SoC under the hood. As the listings appear contradictory, it is difficult to ascertain which configuration will make it to the official model and whether there will be variants in terms of chipset and storage. One of the key features of the Moto X4 is said to be its dual camera module. It is expected to feature a pair of 12-megapixel and 8-megapixel rear cameras with LED flash. Up front, it is likely to house a 16-megapixel front camera. The Moto X4 could be fueled by a 3,000mAh battery and come with IP68 certification for water and dust resistance. Leaked renders of the alleged Moto X4 reveal an aluminum body with Samsung Galaxy S7 edge-like curved display. The smartphone was also seen with a physical home button and a 3.5mm audio jack.